How to filter and sort issues, checkpoints, tasks, users, and more in the issue monitor. In this article we will go over how to use the Issue Monitor to sort issues, create checkpoints, tasks, add users, and much more in the issue monitor. When you log onto your .silvertracker.net site you will be on the Issue Monitor home page. The Issue Monitor is the hub of all the activity submitted from the field using the Silvertrac App as well as Issues and Tasks Dispatched, Automated Reports, Notifications, and more. 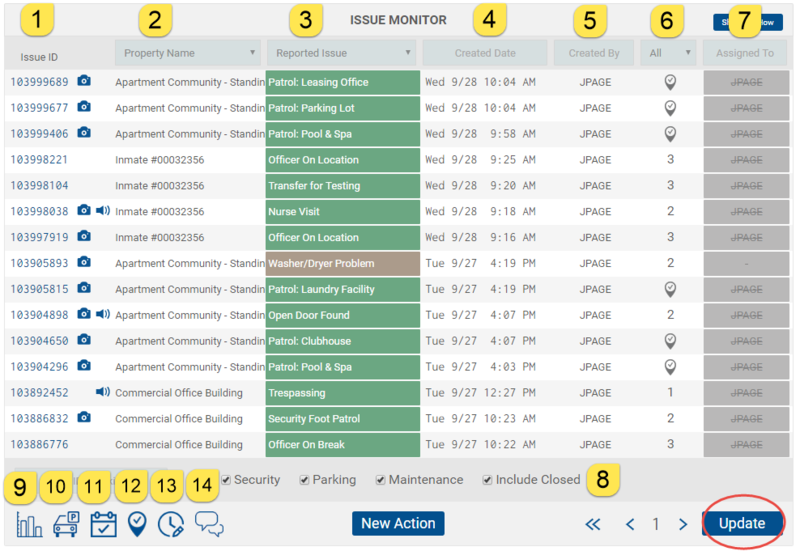 As the issues come into the Issue Monitor in real time there are multiple ways you can search or sort through the data to prioritize the data for easy review. Each issue that comes in is given its own unique Issue ID Number. 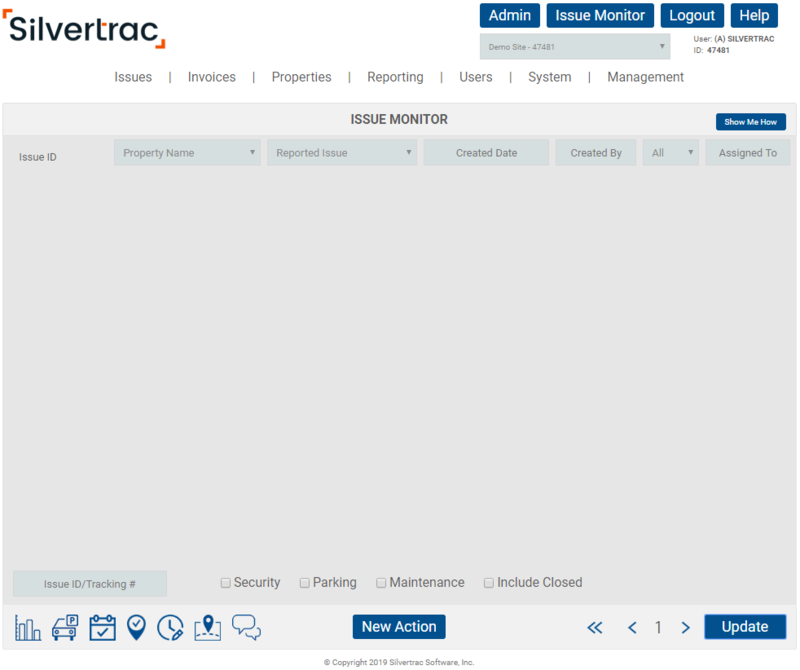 The Property Name Tab allows the user to choose to view only the issues created for a specific property. The Reported Issue Tab allows the user to view only that specific issue displayed. The Created Date Tab allows the user to view only issues created on that date or selected date range. The Created By Tab allows the user to only view issues created by a specific officer or desktop user. The Issue Level Tab allows the user to only view issues designated by issue levels 1,2, or 3. The Assigned To Tab allows the user to only view issues assigned to a specific officer. Below the listed issues there are additional check boxes that allow for additional search filters to be turned off and on. They are Security, Parking, Maintenance and Include Closed. Security allows the user to only view security issues. Parking allows the user to only view parking issues. Maintenance allows the user to only view maintenance issues. Include Closed allows the user to view all closed issues. The Graph icon will allow the user to see an Issue Summary that shows all open security, maintenance, and parking issues and how long it's been since they were created. This is used as a quick snapshot of the open issues. The note icon will allow the user to see a Task Summary that shows all tasks that are currently open in the field. The map pinpoint icon will allow the user to see a Checkpoint Summary of the all the checkpoints (QR codes) in the system, the date they were last hit, and who they were hit by. The clock/note icon allows for the approval or denial of specific Shifts Awaiting Approval. The chat icon allows the user to open a Message Board for one or all officers logged into the system in the field. Anytime changes are made to the specific search parameters you select always remember to click on the Update button to activate your selections.